When my husband first expressed an interest in sending our two-year-old to preschool part-time, I wasn’t too keen on the idea. But after careful consideration, I realized that despite how attached she is to us, our daughter truly was ready. So, on the first Tuesday of the second semester of Pre-K 2’s, off we went! On the night before the big day, I talked to her about what was coming: “You’re going to start school tomorrow! 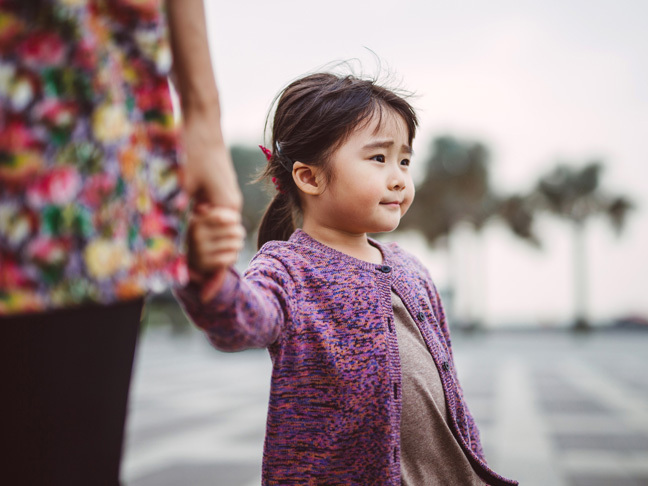 There will be other kids there, and so much to play with and do!” She bawled her eyes out, wailing, “No, mommy, noooo!” This was going to be a shock to the system for both my clingy 2-year-old and her overprotective mama. That night, I couldn’t sleep, and in the morning I felt panicked. I leapt out of bed and brewed my coffee, nervously going over the checklist of first-day must-haves in my tote. My mind raced and my palms were sweating. Family photo book? Check. Take a deep breath. Pack of diapers, pack of wipes. Check. check. Traffic on Prospect. Must leave 10 minutes to spare. As soon as I woke my daughter, the crying began. It took 20 minutes to get her dressed and ease a half of a banana into her system between the thrashing of limbs and choked sobs that did not let up even once. I managed to get us both in the car, along with all the items from the checklist, and down the driveway not 10, but two minutes early, and off we went. In my head, the drop-off would be a bit like the ripping off of the proverbial Band-Aid. Don’t they always say that it’s best for kids when you just split and let it all fall into place than hold their hand and drag out the goodbye for way longer than necessary? Well, our awesome preschool has a better policy in place. I was asked to sit in a waiting area outside the classroom in case I was needed, but she was ushered into the room. They had her pacifier just in case, but they didn’t intend to use it. I was so jumpy, I called a friend and gabbed about work just to change the subject. Meanwhile, my daughter’s teacher and the director of the program herself each came out to update me every 15 minutes or so. After about an hour, I was set free. My daughter wasn’t crying, but instead was enjoying circle time, it was reported. They’d call me if they needed me. The call would never come. As I stood up to leave, the reality of a new chapter in our lives revealed itself. All of these months of deliberation were over, and here we were. The girl who doesn’t reach for anyone but me was doing circle time. And not crying. Without a pacifier. The person who wraps her arms around me like a monkey as I do laundry or collect the mail from the front stoop was doing “just fine” and I was free to go. I had expected to feel sad and empty during the time when she was at school, but suddenly my daughter’s confidence and the fact that she was okay boosted me, too. I picked up a hot cup of coffee as my morning’s cup had cooled long before I’d had a sip, drove to the grocery store, and completed the shopping for the week. I swept the kitchen floor, moved the laundry along, and turned in two articles. I kept busy, but I didn’t feel sad. Soon, it was time to pick her up. As I pulled into the school’s parking lot and glanced at the dashboard clock I realized I was about 10 minutes early. Not wanting to hover outside the classroom like a typical first-day parent, I sat in the car for a few more minutes and checked my e-mail. Right at the top of my inbox was a note from the director of the preschool program, who had snuck into the classroom to check on my daughter and snap some photos of her in action. There she was, my bow-in-hair 2-year-old, sipping out of a real paper cup (at home she won’t use anything but a bottle). Sitting in a circle and listening to instructions alongside her peers. Smiling. It wouldn’t be the last time that my daughter ever cried in the morning before school, though after a few weeks, the dramatics have stopped altogether! In the short amount of time she’s been in school, my little girl has already started to change. She’s picked up habits and expressions from her classmates and teachers, and shows a greater interest than before in learning letters, numbers, and so on. Looking back now I realize that my trepidation had a lot more to do with her attachment to me than it was a desperate cry on my part to keep her little longer. I was shy as a child and felt nervous to thrust her into an environment where she’d feel anxious or alone. But she isn’t me. And as children tend to do, she’s growing. This is just one step of many my little girl will take away from me, and I couldn’t be more excited for her little world to expand far past what I’m able to offer her as a mom. And now that we’ve ripped off the Band-Aid, it doesn’t hurt at all. You just have to take it one day at a time.